These are the absolute best! My dishes always come out sparkling clean! Cascade 2-in-1 ActionPacs are kind of expensive but not that great! I live in a part of the the country that has very hard water. 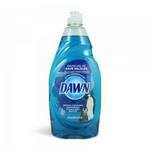 I have tried several automatic dishwasher detergents. I bought a package of these Cascade 2-in-1 ActionPacks when the Cascade powder I usually use was out of stock. They are small balls of cascade packed with rinse agent jell in a water soluble film. You just throw one of these into the dishwasher and press start. They don't work as well as a detergent plus rinse agent separately. In fact, they don't even seem to work as well as a detergent only. I have tried them on lightly soiled dishes to very heavily soiled dishes and the result was the same -- just mediocre. I admit they are very convenient to use. But what good convenience if the product doesn't do the job well? Regular Cascade and a separate regular rinse agent works much better. I rate this product a 6. I won't buy it again. Good quality but not for cheap dishwashers. I have always been a fan of Cascade. My husband and I received a big pack of these dual action packs from Cascade as a wedding gift. We started using them right away and were pleased with them. They were very effective in getting our dishes clean. They left our dishes smelling really good. They were also extremely easy to use because all you did was place one in the dishwasher. Then you close the dishwasher and let it go. All of these things were great. The only downfall we had was that our dishwasher could not get rid of all the residue from them. We live in an apartment and have a cheaper dishwasher. It struggled to really break these a part and get rid of all the residue from it. Our dishes often had leftover spots of the detergent on them. We had to stop using them and switch to liquid. Therefore, if you have a good dishwasher, I would highly recommend these. However, if you have cheaper dishwasher, I would go with another product. Great choice if you want clean dishes! I recently received a sample of Cascade 2-in-1 ActionPacs and then purchased a large bag of these after I used up my sample. This is an amazing product! I have very hard water and use a water softener to help lessen the effects the hard water has on my appliances. It has been hard to find the most effective dishwashing detergent. Many leave a film or residue on my dishes after they have been washed. 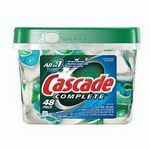 Cascade 2-in-1 ActionPacs leave my dishes looking clean, feeling clean, and they literally sparkle when they come out of the dishwasher. The feature that I like most about this product is that I don't feel like I am wasting any dishwashing detergent. When I use liquid or powder dishwashing detergent, I often find that I spill some of the detergent as I am pouring it into the dispenser in the dishwasher. I like the prepackaged ActionPacs and find that I not only save time but I save on detergent costs. I can often pair a sale and high value coupon to maximize my savings when purchasing this product. Overall, this is a high quality product and I definitely recommend purchasing it and trying it out in your own home! 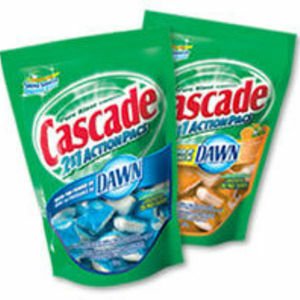 I have been buying the Cascade 2 in 1 ActionPacs dishwashing detergent since they first came out and have been very pleased with them. There is no measuring to do, no mess at all, I just stick one pac in the dispenser of my dishwasher and my dishes come out so much cleaner than they did before using them. I do rinse my dishes before putting them in the dishwasher, but even doing that, my dishes are still cleaner. 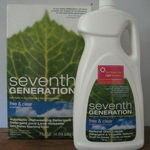 I used to use a rinse product along with the detergent but with these I don't need to. The only problem I have had is that sometimes when I get to the bottom of the bag they will stick together and be a mess in the bag. Other than that I have no problems at all. I don't have spots on my dishes and they feel and are very clean. I would never go back to the powder or the liquid again after using these. 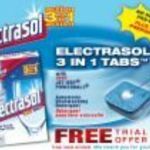 I would recommend these to anyone looking for a great alternative to the powder or the liquid detergent, but as I said, I do rinse my dishes off before loading the dishwasher. I am not sure about how effective they would be if I did not do that. A friend of mine had given me these Cascade 2-in-1 packs that she had picked up for free. These dishwasher cleaning packs are AMAZING! They did a fantastic job cleaning my dishes - even tough dirty pots and pans! Most of the time I have to rinse my dishes before putting them in the dishwasher, but these cleaning packs really tackled rough messes! My dishes came out very clean and shiny and my drinking glasses came out very clean and clear (no white foggy look). 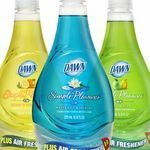 These are very convenient little cleaning packs - just put them in the dishwasher and you are done...no big bottle and messy squirt spout! My only complaint is that you definitely pay the price for this product! Is it worth the price? Well, yes, but this frugal mama won't purchase them full price without a coupon! If you are willing to pay the price for the convenience and quality of clean dishes, then it is well worth your money! Overall, I would highly recommend this dishwasher cleaning packs! It will save you some extra time when it comes to your dishes! I used to use the walmart great value brand but this is a little bit better. I like the ease of the pacs and the convience that I can store it pretty much anywhere vs. the great value powder that is not easy to control the flow PLUS you can only store it pretty much 1 place. I am starting to get leftover residue on my dishes now, like it's all cloudy and also feels powdery, so I figure that the cascade isn't fully dissolving or else my dishwasher needs rinsed. Once I run vinegar through a cycle then maybe it will work better. Other then that it works fine, it gets them clean even after setting in the skin all day. I would maybe recommend it to friends and family, it depends what they use first. If they use finish, well finish is awesome as a rinsing agent so I might suggest using both of them at the same time or just sticking with finish. Overall I gave it 4 stars, 5 would mean better dissolving. I like using Cascade 2-in-1 ActionPacs because they are so easy. Just put them in the dispenser and close it up. Walk away and forget it. When you unload your dishwasher you will find clean sparkling dishes. I love the way my clear drinking glasses come out so clean and I don't have to add a rinse aid. I love Cascade Action Pacs. They are a easy to use and not messy, and my dishes come out clean! We have hard water and have had cloudy dishes in the past. My dishes are sparkling and my dishwasher is too. I love the smell as well. Especially the orange Cascade Action Pac. It's my favorite.